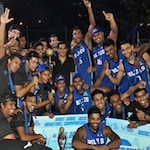 The Federation of International Basketball Amateur (FIBA) of Asia donated 10,000 US dollars to the Sri Lanka Basketball Federation (SLBF) to be given to tsunami affected basketball players. The Sri Lanka Basketball Federation Tsunami Relief organising committee chairman and member of FIBA Ignatius T. Canagaratnam who represented the country at a Congress in Kuwait received the donation. At the Congress former SLBF president Canagaratnam was re-elected as a member of the FIBA Asia central board for the fourth consecutive time to function from 2006 to 2010. Canagaratnam who is a retired Deputy Inspector General of Police was the first Sri Lankan to be elected to the Asian basketball body when he achieved this honour in 1994. Earlier in 2002 he was also honoured with a special recognition award at a ceremony in Malaysia for his contribution to the development of Asian basketball. Canagaratnam was the president of the SLBF in 1994, 1995, 1997 and 1998 and was vice president in 1996, 1999, 2000, 2001 and 2002.